The world missed out on a Zombie Apocalypse. Long before the current trend of Zombie – mania invaded Hollywood ( The White House?) there were some very ‘ fab’ lads from England on the brink of invading the continent of North America. Along with the likes of The Animals, The Kinks and The Who – the Zombies were a Pop / Rock band from England. Like The Rolling Stones and The Beatles before – The Zombies landed on North American soil and gave both Canadians and Americans a taste of their tunes before heading back to England. Unlike the Stones and The Beatles , The Zombies broke up and the second tour of North America in the sixties never happened. Following the release of their album ‘Odessey and Oracle’, The Zombies were dead. In Montreal on a day meant for fools – The Zombies returned with a new song from their latest album ” Still Have That Hunger ‘on The Billboard Top 100. ‘I Want You Back Again’ made Montreal realize what the music world missed out on for almost twenty years. The song ‘I Want You Back Again’ ( originally released in 1965) set the tone of the evening. Blunstone explaining how Tom Petty’s cover was both an honor and motivation to re-do the old tune. ‘Moving On’ (also from the new album and on Billboard Top 100) displayed the connection The Zombies and all British Invasion bands had with American Blues. An upbeat ‘swampy’ number filled with funky beats and a lethal guitar solo by Tom Tooney. Blunstone’s vocals seemingly more powerful than in the sixties. ‘ Edge of the Rainbow’ – also from the new album, once more put forth Blunstone on full display. Colin, at one point on the current tour, hospitalized with a virus – showed no ‘ill’ effects from his brush with a hospital bed. In fact – Argent ( keyboards,vocals), Rodford (bass,vocals), Toomey (guitar,vocals) and Rodford Jr (drums) all played music like a bunch of twenty – year – olds. Proving music is indeed the elixir of youth for both the performers and the mostly ‘over-fifty’ folks in attendance at Le Nationale. The Zombies, in their original formation, followed the vein of The Beach Boys. Harmonies were and continue to be the cornerstone of The Zombies’ sound. Commencing in 1961 with Paul Atkinson (guitar), Rod Argent (keys), Hugh Grundy (drums) , Colin Blunstone (vocals) and Paul Arnold (bass) – the ‘choir’ in the boys was upfront and personal. On Saturday evening in Montreal – two songs which placed The Zombies into music history, started the ‘fete’. ‘Tell Her No’ and ‘She’s Not There’ injected nostalgia and ‘sixties’ life into the venue. The only thing missing were Airey, Atkinson and Austin Powers (aka Mike Meyers). ‘I Love You’ (1965) is perhaps the earliest example of how harmonies were such a huge part of the Zombies’ sound and a precursor to the band’s ‘Pet Sounds’; Odessey and Oracle. The tune, a reverse gear into the late fifties ‘backseat make-out sessions’ which were so profound in American culture. 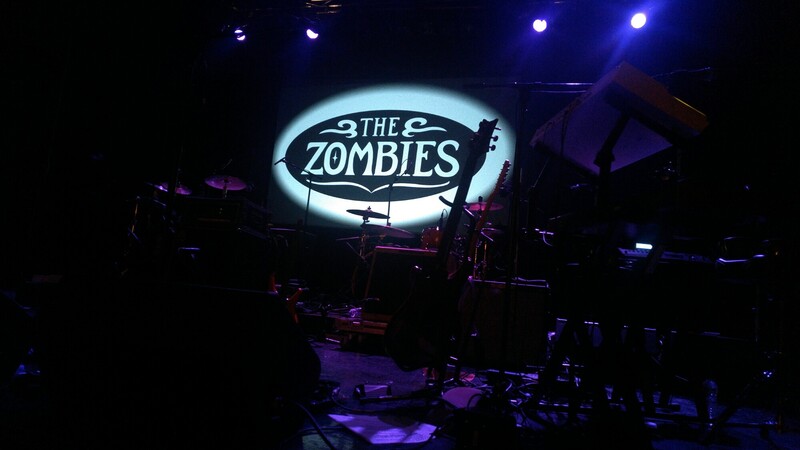 Saturday evening was The Zombies way of placing ‘less is more’ in the consciousness of the public and wannabe musicians. The second half of the show (following a brief intermission) was the piece de resistance for Zombie fans. Imagine being able to see and hear The Beatles performing Sgt. Peppers live? For Zombie – ers, bliss was obtained. What if The Zombies had not broken up in 1969? Quite simply, the world in 2017 would be ‘less dead’ . Pingback: The Zombies Return to Montreal! Previous Previous post: Rick Keene Music Scene – Six Songs You Can’t Say on Televison ( or How I Learned to Stop Worrying and Love Benny Hill ).